Although it only featured a few different scenes, Kingdom Hearts 3's new trailer did actually tell us a few interesting things about the game's story. 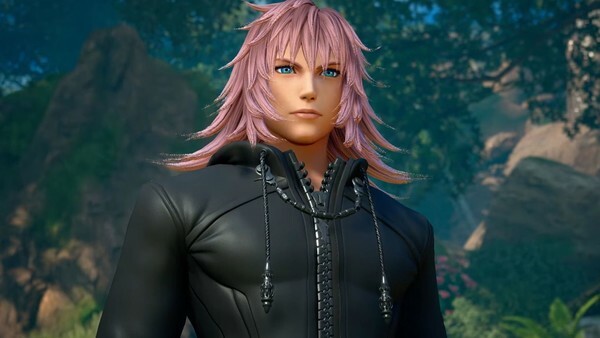 One of the more interesting is that Marluxia, the original leader of Organisation XIII, has been revived and appears to be roaming the world of Corona. What he's doing is entirely unclear, as he doesn't appear to be one of Xehanort's vessels yet, but does seem familiar with his masters plan. This could be hinting at the return of all of the members of Organisation XIII, but for now it's just Marluxia. Sora, Donald and Goofy don't remember Marluxia, which is a pretty neat callback to their memories being altered during Chain of Memories, but I doubt they won't remember him for long. Another big story detail came from the return of Vanitas, who Sora subconsciously remembers because of the former's connection to him. It's pretty cool to see the villain return, although how he's come back to life and what he's trying to do with Sora is still shrouded in mystery.